In the mood to throw a Wiimote around? 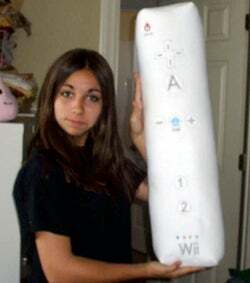 Save your $3000 HDTV by chucking this Wiimote plushie pillow instead. The thing stands 26 inches tall, 5.5 inches wide, and was handmade by some people who really like Wiis. Unfortunately, it's sold out now, but if you bug them enough about it they'll make some more for the low, low price of $20.